Our team has reached 80% completion at quay point apartments where our team has abseiled the exterior facade using industrial rope access to descend the external facade to carry out painting work where we did not need to use expensive scaffolds or work platforms that are all disruptive and expensive. Our expert team have now completed confined spaces works on a exhaust vent shaft that went down the entire length of the building height and our team abseiling down to carry sealing works as requested by client. All works has been completed and carried out successfully on time and on budget. If you have a confined spaces works we are the expert to provide you with all your needs. Rope Access works or Abseiling Access, is known to save huge amounts of money for owners and managers of buildings and or structures, who require works to be carried out at heights or in difficult to reach areas. All sorts of works can be carried out via Industrial Rope Access, including but not limited to concrete repairs, painting, window repairs, and any area of general facade maintenance. 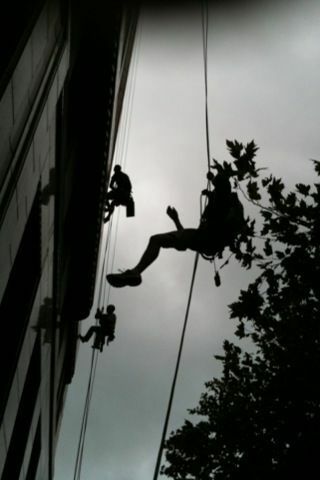 Call us today on 1300 789 474 to find out how we can assist you with our Abseiling Access Services. Industrial Rope Access Survey Services are a means by which you can have the exterior facades of any structure inspected for remedial repair needs. Whether you think you may need some concrete repair, want a sign checked for stability, or need general information about the state of the exterior of your building, Abseiling Surveys are the way to go to get a quick and cost effective result where other methods such as scaffolding or mechanical lifting equipment would otherwise be needed at great cost. 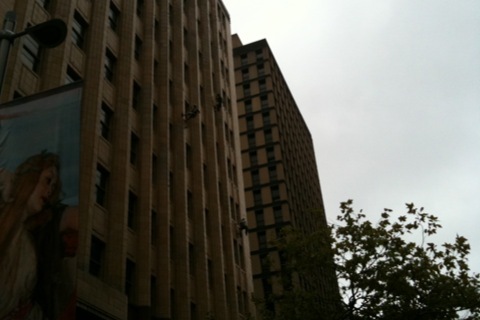 Call us today to see how we can assist in conducting a Rope Access Survey for your building on 1300 789 474. Industrial Rope Access Painting is one of Advanced Solutions Group’s main areas of operation, with many fantastic abseil painting projects completed throughout the Sydney metro and beyond. We have several major projects running at any given time and we would love to add your upcoming abseil painting project to our portfolio of happy customers. Our highly skilled and professional abseilers are able to cut costs for you when it comes to painting projects that would otherwise cost many thousands of dollars in lifting equipment or scaffolding. We are also able to get to those difficult access areas where these methods are unsuitable. Give us a call today to find out how we can assist you with high rise painting on 1300 789 474. Height Safety is serious business. The lives of workers are at risk, any time they are required to work within a fall zone at height. Height Safety System Design and Installation is necessary to ensure that sufficient safety mechanisms are in place to limit or eliminate the chance of injury or death from a fall. Anchor Point Installation is a key area in which Advanced Solutions Group provides expertise and service. We have designed, supplied, installed, mechanically tested, tagged & certified countless height safety systems, from simple single user fall arrest systems or full abseiling industrial rope access system installations for high rise access. Do you need us to assess your current system, test your anchorpoints, or design & install a system from scratch? We are able to offer competitive rates and expert advice via our Height Safety Division and are able to assemble and install height safety systems of all sorts. 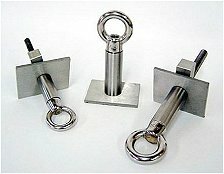 Call us on 1300 789 474 to discuss your anchor point installation needs. Painting by abseiling or Industrial Rope Access Painting, is the best, most affordable and cost effective means to update or maintain the exterior facade of any building. Advanced Solutions Group’s Industrial Rope Access Painting personnel are amongst some of the most skilled and highly trained rope access painters in Australia. Call us on 1300 789 474 to discuss your project. Industrial Abseiling Access, or Industrial Rope Access is a fast growing industry, particularly in Australia. This is due to the ongoing discovery by building managers, owners and occupiers, that undertaking works via rope access is the most cost effective and flexible means by which you can conduct works such as painting, concrete repair, installations, and any aspect of general maintenance or remedial building works. Many new companies are emerging offering services via rope access. They mainly offer window cleaning services and don’t have the personnel or equipment to effectively provide building maintenance services. Not all of these companies are as experienced or equipped as Advanced Solutions Group’s division of expert abseiling personnel. Our highly trained and skilled personnel are some of the most experienced Industrial Rope Access personnel in Australia and have a reputation for producing high quality work for comparably reasonable costs. Why pay for expensive mechanical lifting equipment or scaffolding when all of your maintenance needs can be carried out via our expert Industrial Rope Access technicians. Our abseiling team are 70% complete of a internal riser exhaust confined spaces job where our team has to abseil down the vent shaft that is 350mm x 2000mm and needs special hauling gear to get our abseiler in and out of the cavity, this is due to the cavity having penetrations that allow the exhause gases through the wall that we will are sealing up. We will keep you posed with pictures when the job is complete….